On glossy white card, Brayer using Desert Heat Kaleidacolor ink. 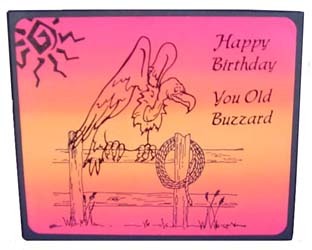 Stamp Buzzard, Fence, Sun and Happy Birthday with Memories black or any permanent ink. Note: You may choose to mask the buzzard. Stamp bird first, mask area that will be stamped over. Stamp fence as shown.